If you’re looking for an essential, easy kitchen appliance that can help turn ordinary meals into extraordinary meals, you simply must invest in a crock pot or slow cooker if you will. 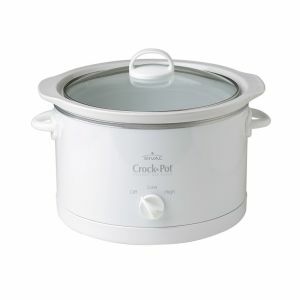 Crock pots make delicious, easy, and complete meals without any of the hard labor! Kate and I went shopping at Trader Joe’s the other day. It was the most packed either of us have ever seen! I suppose it being the day after Labor Day, people needed to re-stock after their end of summer picnics, etc. At any rate, we decided to brave the crowds. Kate decided to grab some simple chicken breasts. She and I are very similar in the fact that we just grab the essentials without any thought of what we’re going to make. We buy stuff then figure out what we’ll make with it later. Obviously chicken breast (and chicken in general) is a very versatile meat. There are so many options and ways to prepare it. Kate asked me yesterday “What do you think about pulled chicken?” To which I responded “I think I like that idea!” I’m a huge fan of pulled pork! In fact, I usually make that at least twice a year. As for pulled chicken, I believe I made that once in the past, though it was done on the stove and served with a sweet cola barbeque sauce. Kate noted she was going to throw the chicken breasts in the crock pot and let it cook all day. I was certainly down with that idea! That’s it! It cooked on low for about 6 hours. So when it was dinner time, the chicken was perfectly cooked and marinated in the sweet heat sauce. She simply took the breasts out of the pot, pulled them with 2 forks, and then dropped the pulled chicken back into the sauce. I served mine on whole wheat bread with some soy cheddar cheese slices. Delicious, filling, and so very satisfying. Next time you don’t know what to do with your chicken, drop it in the slow cooker, with a few choice items and you’re good to go! Tags: brown sugar, chicken, chicken breasts, crock pot cooking, hot sauce, pulled chicken, veggie stock. Bookmark the permalink.